Dr. Rajendra Sharma was probably one of the proudest mothers who stood and applauded the College of Medicine’s Class of 2022 at Monday’s White Coat Ceremony. This was the second such ceremony for Sharma, a Fort Myers-based physician. Two years ago she watched her first daughter and today, her second daughter, receive their white coats, symbolizing the beginning of their medical school journey at UCF. “There are really no words to describe my emotions, but I am really very happy that my girls are achieving their dreams,” said Sharma, an infectious disease specialist with Lee Health System. Sharma said her daughters, Naina, 23, and Nisha, 22, were always passionate about medicine and were determined at a young age to be doctors even though sometimes she tried to dissuade them because of profession’s demanding nature. 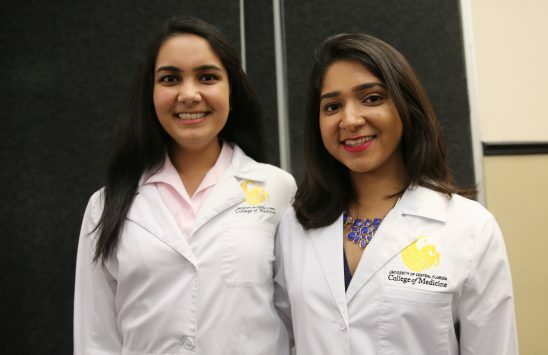 Her younger daughter Nisha joins big sister Naina who is entering her third year of medical school at UCF. Nisha was born in India and moved to the U.S. with her family when she was only three months old. She did her undergraduate work in neurosciences at the University of Miami where she researched the effect of an enzyme in suppressing certain cancer tumors. An advocate for female empowerment, Nisha was the service chair for the University of Miami’s chapter of “Girl Up,” a United Nations initiative that teaches young women leadership skills. She also served as coordinator for Whitely Women’s Leadership Symposium, a forum that prepares UM students to become effective leaders. She credits her mother as being the first role model that led her to medicine. Her older sister too has been a ‘major support system’ and lifelong mentor, she said. Naina will be spending much of the next two years of medical school in clerkships rotations at hospitals and clinics, so she won’t see much of her sister at school. But she is looking forward to sharing med school adventures over dinner with the sibling who is now her new roommate. Class of 2022 Completes Medical School "Wall of Fame"